We offer a wide variety of bangles, in an assortment of sizes (from infant to adult). Most of our bangles, which are made of either metal or plastic, are sold in boxes of 48. Each box of 48 contains an assortment of the colours in which that particular bangle design is available (one size per box) - size to be specified by the customer. 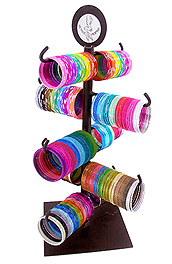 OR allow us to put together a bangle stand of mixed sizes, colours & types tailored to suit their specific target market. 1. Our Promotional Bangle Stands wholesale for R85.00 each - being a one-off purchase – which we sell at cost price. Experience shows that bangles sell far quicker from these attractive displays than they do, say, from a basket. 2. A fully stocked bangle stand takes 480 bangles (48 on each arm) and, although this may sound like a lot, please bear in mind that shoppers seldom buy one bangle at a time. 3. Customers may either choose their own selection of bangles to fill the stand, or ask us to supply a great selection of our top selling styles and colours. 4. Each Bangle style and/or size will be supplied in a box of 48, which will include a few of each available colour in that specific style. 5. Customers who would prefer us to choose a selection for them, should please provide us with details of their target market - (e.g. kids, teenagers, adults etc) - also bearing in mind that for light complexions, pastel shades are the best match and for dark complexions, bright colours or, gold inner, rainbow bangles work particularly well.